For a luau-themed rehearsal dinner set in summertime, transport your guests to a tropical oasis decorated in the vibrant hues of the season. And what better way to do this than the “natural way”—using sun-kissed fresh fruits! Just imagine table decor and centerpieces fashioned from watermelons, mangoes, pineapples, bananas, cantaloupes, and papayas. You not only get a whole spectrum of vivid colors, you also bring in an array of interesting textures and tempting aromas. So, if you’re ready, let us show you how to bring the tropics to your party with fruits! Of course, what would a luau be without a spread of fresh tropical fruits? Mix and match whole fruits with wedges and slices, and arrange them to best show off their contrasting colors, shapes, and textures. Who needs a traditional floral centerpiece when you have such a stunning presentation? Looks good enough to eat, you say? It is! 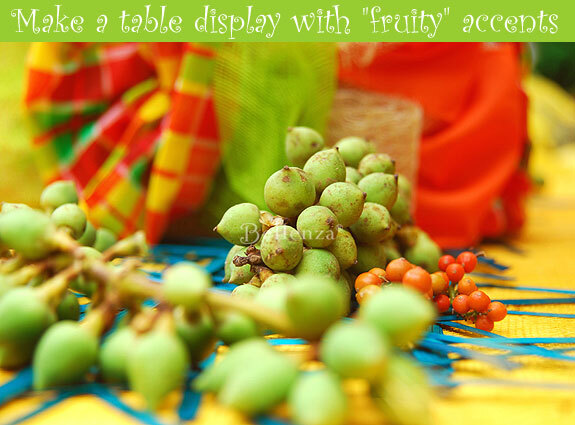 Assemble a truly organic-looking table display with “fruity” decor accents. Here, we’ve used bunches of berries still on the stem, strips of dried cane and sheets of sinamay dyed in striking hues, and fabrics in an entire rainbow of yellow, orange, and green—fruit colors all! 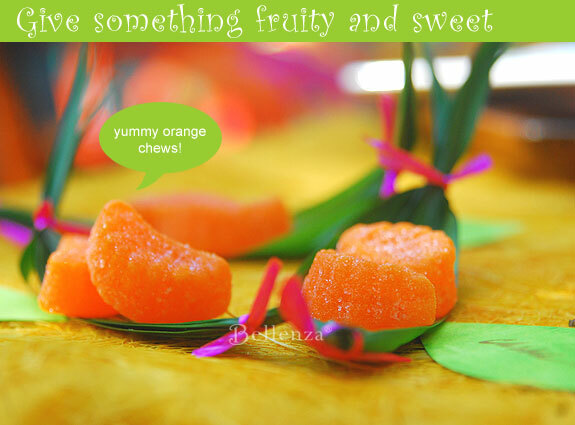 Orange-flavored chewy candies are a fun way to say “hello” to your guests as appetizers set out beside each place setting. Note the clever leaf trays, and matching leaf-shaped place cards. These sweet treats can also say “thank you” to guests as take-home favors. Simply wrap them in cello bags and tuck them into fruit-colored favor bags. These hand-crafted shell card holders immediately say “the tropics.” Add a fruity angle by having them hold name cards cut in whimsical shapes, like these bright yellow pineapples. When the party draws to a close, the cards then serve as gift tags as the guests take the shell pieces home as mementos of the occasion. In the true spirit of summer, why not give actual fresh fruits as guest favors? Not only are they pretty, they’re delicious and healthy, too! Here, a golden mango becomes an attractive take-home gift, with a leaf tag held in place by a pin stuck through a wooden bead. 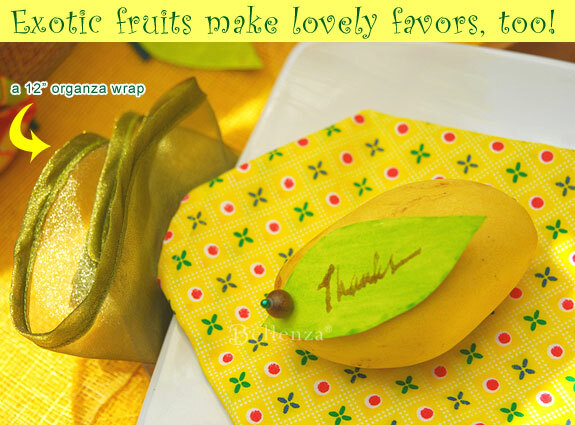 And speaking of fruits…notice the napkin folded in a pineapple shape with “leaves” of olive organza fabric. Preserved or candied tropical fruits make special edible favors with an exotic flavor. Here, strips of dried mango from Hawaii look particularly enticing all curled up on toothpicks. And the pretty shell “tray” they’re sitting on? It’s actually a picture frame that’s the real guest keepsake. 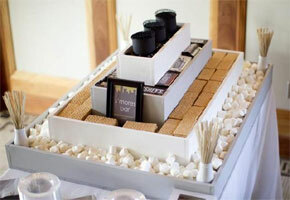 How’s that for a (literally) off-the-wall favor presentation! Give your luau guests a true taste of the tropics with desserts, sweets, and beverages made from scrumptious, real fruits. It can be something as simple as a refreshing mix of fruit chunks, served chilled in ice cream bowls. Or you can serve tangy mango or pineapple sorbets, freshly-blended watermelon or coconut shakes, or fruit-based desserts like banana cake, mango cream pie, and that old favorite, pineapple upside-down cake. Yummm! 1. 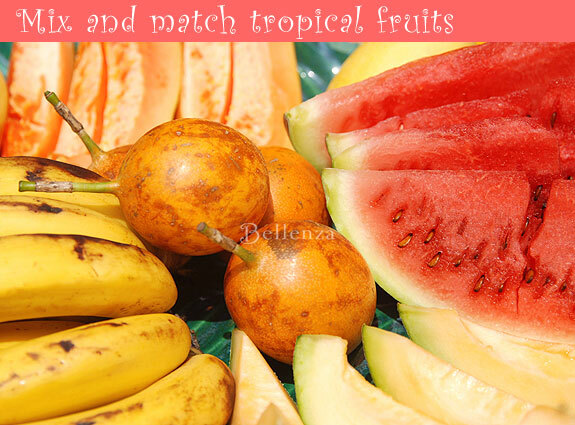 Wondering where to buy fresh tropical fruits? Try your local farmer’s market or ethnic grocery. 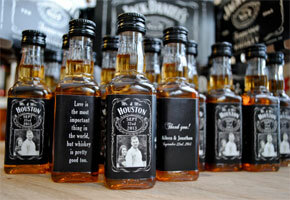 They may also be specially ordered from select vendors in places like Hawaii or Puerto Rico. 2. If you want to go even more exotic, consider tropical fruits beyond pineapples like kiwi, carambolas (or star fruit), coconuts, guavas, pomelos, passion fruits, dragon fruits, etc. 3. Fruits are “naturals” when it comes to creating spectacular centerpieces. Even with the most basic serving pieces such as large glass or wooden bowls, they look instantly attractive because they’re just teeming with texture and color. 4. Your luau may be the first time some guests will get to taste fresh tropical fruits. Prepare mouth-watering shakes such as watermelon or coconut shakes, including banana cake. Make your presentation so irresistible, they’ve got to give it a try! 5. Give unique fruit items as guest favors, like dried mangoes from Hawaii—and present them in an equally unique way, like picture-frame trays! 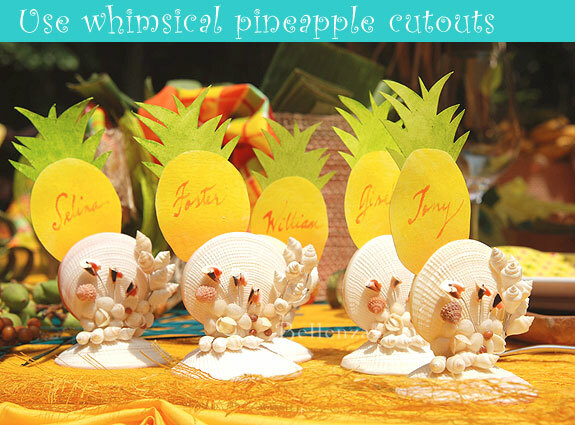 Or make your favors whimsical using pineapple-shaped place cards that are presented in shell card holders. 6. 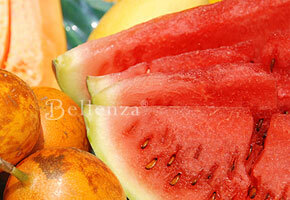 Make tropical fruits a part of the decor of your place settings. Fold up a napkin into the shape of a pineapple! For more ideas on how to create unique table napkins, read Become a Table Napkin Artist. 7. Craft an exotic tropical color palette that is inspired by tropical fruits. Consider vibrant hues such as yellow, fuchsia, and green. Wondering how can you use vegetables? See our easy tips on making centerpieces with shapely vegetables! I love the idea of serving tropical fruit shakes!! 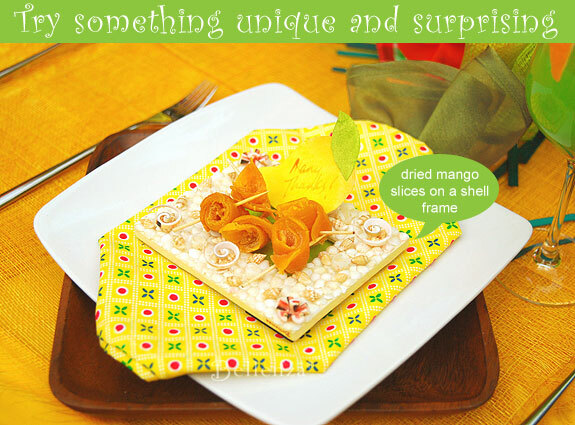 And the dried mango presentation looks so beautiful – almost like little rosettes!